Please see below our Terms & Guidance for Dog Fit. Following this guidance will ensure the walks' runs smoothly & will be a safe and enjoyable experience for all handlers and dogs. 1. Dog Fit is undertaken at your own risk. 2. Please take care on our walks. We will not be held responsible for any personal injury or injury to your dog sustained whilst participating in Dog Fit. 3. Please be physically able to go on a walk for up to 90 mins with your dog. You are in a group with other dogs, so your dog may pull more or behave more excitedly initially. 4. Please wear suitable clothing and footwear for these walks, they will be across fields, woods, bridle paths and streets. 5. Please be aware you will be in public places so all the dog related legislation applies to you and your dogs. 6. Always have pooh bags. 8. If you feel the need to use a muzzle then please use it. 9. Please be aware of your responsibilities under Section 3 of The Dangerous Dogs Act 1991. Dogs dangerously out of control - Under section 3 of the Dangerous Dogs Act an owner, or a person in charge of a dog, commits an offence if the dog causes reasonable apprehension to a person that they will be injured, whether or not they actually are injured. 10. 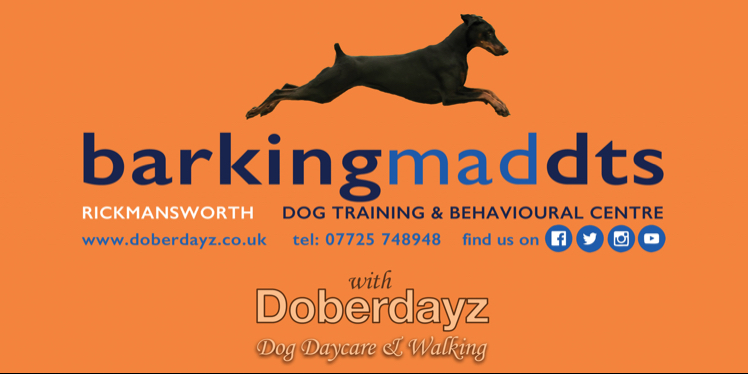 Barking Mad DTS with Doberdayz reserves the right to discontinue this service if these rules are not adhered to and no refund will be given. By completing this form, clicking the 'Subscribe to List' button and submitting this form you are agreeing to follow our terms. You are also agreeing to receive our newsletter and training emails but you can unsubscribe from these at any time. Does Your Dog Have Any Behavioural Issues?